I’ve been actively building HireGun for about 8 weeks now after it launched in semi-decent mode around February 2013. I have always known that it could exceed my expectations, and it’s been amazing to watch it do so over the last couple of months. I’m a businessman and an entrepreneur, but I’m always going to get excited by website metrics. Today, I want to show you precisely how I’ve improved three directional metrics on HireGun over the last few months as I’ve been working on the platform. One metric that I’m not going to focus on in this post is traffic, but as you can see from the screenshot that is up dramatically. And leads and revenue are up significantly as well. Here are the changes that I made that have affected all of these metrics. For the first few weeks, I focused on making the site something I was proud to look at – smooth, well-formatted, and well designed. The biggest change, which I tested before shipping live, was to change out the image on top of the homepage to make it more professional and inviting. With a 20% increase in clickthroughs to deeper pages, I’d say that was a success! 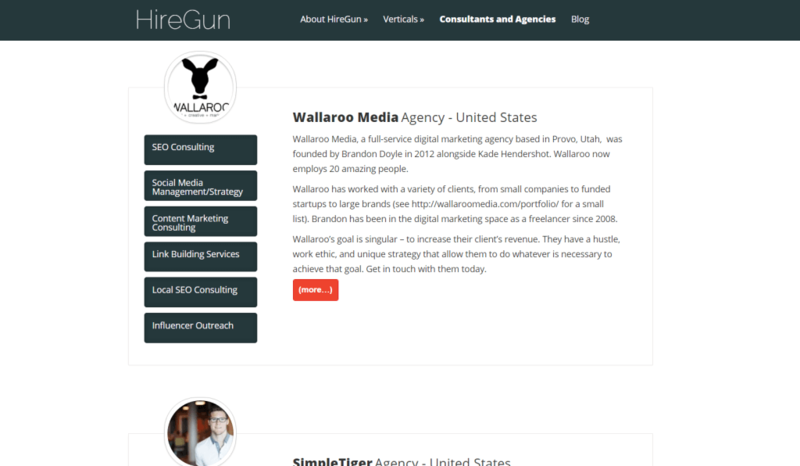 When I launched HireGun a few years ago, it was a Google Sheet list of consultants and agencies. When a lead came in, I would literally go to that list and find people who took that kind of work and fit within the lead’s budget. It was an MVP of epic proportions! When I started working hard on the platform, I realized very quickly that when leads scaled, I would be absolutely unable to keep up with demand. Plus, I had a lot of people asking me who was on the platform and if they sent me leads that they couldn’t take, who would they go to? Luckily my theme allowed for a “Team” page, so I set about doing some product development on the supply side of the house and launched the Team page two weeks ago. Since the launch, traffic to this section of the site has scaled and leads have increased as well. The traffic to these pages stays on the site 3x as long as the site average and views 30% more pages per session. Bada-boom. For a while, I was publishing blog posts on the site and had the posts linked from the sidebars of the different services pages. I kept receiving questions from people about “when are you going to launch a HireGun blog?” I’ll be honest that I had no idea how easy it was within WordPress to create a blog on my site. I launched the /blog/ page on October 16th, and that alone accounted for the increase in traffic that week, and it is the 6th most often visited page after landing on the homepage. I’ve published 10 blog posts in the last 8 weeks which have accounted for almost 1/3 of all traffic to the site. Content is a valuable part of our customer/lead acquisition strategy, so it has been heartening to see that content is actually driving great traffic and also contributing directly to leads (Twitter is the highest performing acquisition channel right now) and building our marketing email list. HireGun was slooooow until a few weeks ago. As I wrote about in the launch post, I did not even buy the domain name or launch the website until the first lead was passed along. I put the site onto some shared hosting that I had on Dreamhost, which of course was cheap. I had moved on from BlueHost, which was also painfully slow, and to be honest Dreamhost wasn’t much better for me. These are just some of the changes made over the last couple of months to increase engagement and leads on the site. Every now and again it’s worthwhile to look back to see what has worked and what hasn’t so that we can make better decisions in the future. What else should we try to move the needle on these metrics? By the way, need content marketing help? We have the best.